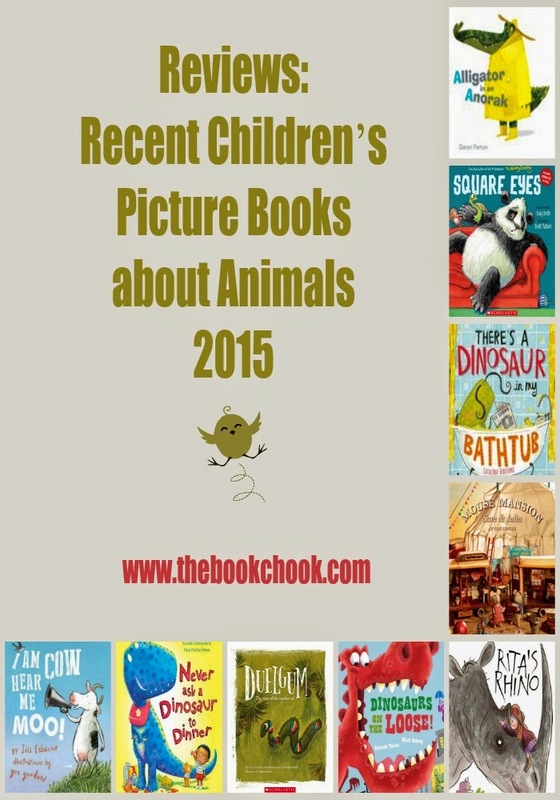 Books with animal characters are perennial favourites with kids. Here’s a diverse selection, each of them ready to delight the children in your life! * Alligator in an Anorak by Daron Parton, published by Random House Australia, 2014. This is a children’s alphabet picture book with a whimsical twist. Each creature chosen is presented in an alliterative situation - Tiger in a Tent, Panda in a Paper hat. The humour of the illustrations is what lifts the book above the ordinary - large, bright and colourful with the focus squarely on individual quirks. There is also interesting vocabulary for kids to absorb - anorak, xantus, kayak - and the book just begs for a discussion about whether alliteration is repetition of sounds or letters! Regardless of whether urchin and undies is truly alliterative, kids will find the pictures and the concept hilarious. * I am Cow Hear Me Moo! written by Jill Essbaum, illustrated by Gus Gordon and published by Penguin/Viking, 2014. Esbaum has written the story in rhythm that bounces along, sweeping young readers into Nadine’s adventures. Gordon’s illustrations provide all sorts of details for extra humour and comprehension. I hope you’ll find this charming children’s picture book for the kids in your life - they’ll love it! * Square Eyes (with CD) written by Craig Smith, illustrated by Scott Tulloch and published by Scholastic NZ, 2014. RRP: $Au16.99. I love the message behind this children’s picture book - walk away from screens, get some exercise, take yourself to the library and use your imagination. I also love when a publisher offers an audio CD with a book - children can read along while they listen to the text of the book being sung. Kids will love singer/songwriter Smith’s humour - for instance, “Let’s think about this…what else can be done? Besides sitting inside seated on your … CHAIR.” I’m sure there’ll be lots of offers for near-rhymes for “done” in classrooms everywhere! Tulloch has chosen a panda for his main square-eyed character, and there are young animal friends trying to turn him from couch potato to pandariffic. * Rita’s Rhino by Tony Ross, published by Koala Books, 2014. RRP: $Au14.99. Here’s a delightful tale, filled with Ross’s trademark humour. Rita wants a pet and her parents try to persuade here to have a small one, like a flea or a tadpole. But when she visits the zoo and meets a rhino who hates the rain, she brings him to her lovely dry home to be her pet. Children will giggle over Rita disguising the rhino with her (tiny) hat and coat and guffaw about her problem with hiding huge piles of rhinoceros poo. Although the rhino loves Rita, when all the kids use him as a bouncy castle, he decides to return to his former life at the zoo. The two really miss each other, but they come up with a plan that helps them cope. Ross’s illustrations complement the story beautifully. * There’s a Dinosaur in my Bathtub by Catalina Echeverri, published by Bloomsbury, 2014. I loved the dinosaur! His name is Pierre, he comes from France, and sports a wonderful Poirot-style moustache. He is also very good at hiding - or is everybody amazingly oblivious to a large green animal in the neighbourhood? Amelia loves the adventures they share - from travelling to the moon each Tuesday for hot galactic chocolate with marshmallow stars, to roller coasters and eating stinky cheese at picnics. Echeverri has provided lots of visual treats - French phrases scattered about for that touch of je ne sais quoi, lots of details to pore over, and an exquisite and exciting colour palette. A truly lovely children’s picture book! * Dinosaurs on the Loose written by Amanda Tarlau, illustrated by Mark Osberg, and published by Koala Books, 2014. RRP: $Au14.99. Tarlau uses simple rhyming couplets to describe the antics of dinosaurs as they wreak havoc on the town. Kids will find the brightly coloured and energetic illustrations engaging, and perhaps find the text easy to memorise, making this children’s picture book suitable for double-duty, both as read-aloud and early reader. * Never Ask a Dinosaur to Dinner written by Gareth Edwards, illustrated by Guy Parker-Rees and published by Scholastic UK. Only slightly more complicated than Dinosaurs on the Loose (above) this children’s picture book too will make both a read-aloud and perhaps prompt kids to memorise and “read” for themselves. It’s rollicking rhythm and rhyme sweep the reader along and there are lots of scenarios to make kids giggle as they’re advised to never use bison as blankets or barn owls for cuddlies. Parker-Rees’s illustrations are bursting with colour and character. * Duelgum: The Story of the Mother Eel written by Uncle Joe Kirk, illustrated by Sandi Harold and published by Scholastic Australia, 2014. RRP: $Au15.99. This is an Australian Aboriginal story told by Uncle Joe Kirk, who is a Brisbane and Wakka Wakka elder. Duelgum is the mother eel who lives in a waterhole near the banks of the Brisbane River. Duelgum also relates to “belonging” in Wakka Wakka culture. Uncle Joe relates the mother eel’s journey to the ocean to lay her eggs, and then we learn more about the cycle of nature in the return journey of the girl eels to their mother’s home in the waterhole. This children’s book reminds me a little of the annuals I loved to read when I was young. It’s more like an illustrated chapter book than a picture book. There are multiple stories/chapters related to Mum and Julia’s adventures at the circus, and others about Sam’s doings back at Mouse Mansion. Sam and Juila and all the other characters are mice. It’s the illustrations that make the book a visual feast. What an incredibly detailed world Schaapman has created! The model of Mouse Mansion itself is three metres high, with over one hundred rooms. Schaapman crafts every scene and character by hand, and the illustrations are photographs of the different scenes she creates. Read more about it here, including tips to make your own mansion for mice. If you’re looking for a fun and engaging children’s picture book with rhyme, bouncy rhythm and gorgeous cartoon-style Australian native animals, try Conga Dance. It’s a very simple story about a group of Aussie animals dancing the conga until they all fall in a laughing heap, courtesy of an unexpected spectator. Here’s the story of Thelma, the horse who longed to be a unicorn. When a happy accident helps her look exactly like a unicorn, Thelma becomes an overnight sensation. She thrives on the fame until she realises it has a down side. Will she realise that just being herself is best of all? Using strong rhyme and rhythm, Blabey spins a humorous tale with a thought-provoking message. In trademark Blabey style, the illustrations are colourful, quirky and have lots of detail for children to pore over and discuss. Here's Blabey reading it aloud if you need more convincing! * Slug Needs a Hug written by Jeanne Willis, illustrated by Tony Ross, and published by Koala Books for Scholastic, 2015. RRP: $14.99. When it begins to bug slug that his mummy doesn’t hug him, the other animals come up with various ideas to make him more attractive. Soon Slug has a new look. Will his Mummy hug him now? Willis and Ross are a great picture book combination! Ross’s colourful cartoonish illustrations set off Willis’s romping, rhyming text to create a fun tale about Slug. Kids will chortle over the accumulation of props Slug wears, and enjoy the happy ending. If you’re interested in discovering more children’s books, check out Reviews: A Monstrous Mouthful of Picture Books, Beautiful Books for Babies, Recent Picture Books for Kids with an Australian Theme, Recent Children’s Picture Books about Animals, A Swag of Australian-themed Picture Books, Recent Children’s Picture Books about Birds, Reviews: Three New Picture Books about Dinosaurs, or simply click Reviews in the right side-bar.